Recently announced is a 5th Anniversary Edition for The Elder Scrolls IV: Oblivion. Coming in a 3-disc SteelBook case and available on June 28th in the USA. The lack of high quality horse armour enrages me. it's too pricey for a discounted edition. but how can i enjoy Oblivion without the only DLC which makes it worthwhile??? Clearly you'll have to wait for the 25th anniversary edition. It's likely Bethesda just doesn't want to blow their load for the 5th. I was hoping for Elder scroll 1-3 bundle with this. IMO the pc version is best version to get. You get a lot of mods and addon by Obvilion community. Would of been nice but doubt Bethesda want to invest the time and money into porting Arena and Daggerfall to consoles and Morrowind to the PS3. I have to agree with you on the best version, i would of stopped playing Oblivion years ago if it hadn't been for the awesome community which is still pumping out mods for it. Its probably also the reason i find littlebigplanet and modnation a pile of rubbish. I will be grabbing this, I am done with Oblivion, but am most definately getting Skyrim so $30 bucks minus the $10 dollar coupon equals $20 bucks for an Oblivion Steelbook. I'll take it. my thoughts exactly.... who here ISNT a sucker for SteelBooks ? Is this being released outside of the U.S.A? Any word on a PC version, or if it includes fights stronghold or Steamworks(I hope for both)? Not sure mate, am hoping so - can this be pre-ordered yet guys? Its possible since Bethesda have yet to make an Official announcement about this edition ( I Think). But if your buying it to play and not keep sealed why not just get the GOTY edition (If you don't already have it) to play and get a NTSC version to display? They have exactly the same in-game content. 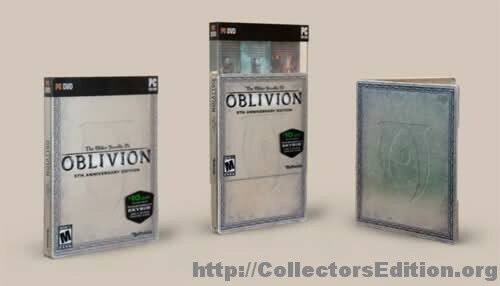 I will be grabbing this, I am done with Oblivion, but am most definately getting Skyrim so $30 bucks minus the $10 dollar coupon equals $20 bucks for an Oblivion StWwweelbook. I'll take it. I think you have to buy Skyrim and the strategy guide to use the $10 coupon. I tried ordering through amazon but it wont ship it to Europe.Anybody know a store carrying it and offering Europe shipping? GameStop.ca will only ship orders within the country of Canada. You can order it through Gamestop.com. They will ship worldwide.